We are now less than one month away from our March 8th shows on HSN! We’re thrilled to get to be on with you at midnight, 11am-1pm, 4pm, 5pm and 8pm (all EST). We’re going to have a great time showing you just how easy it is to create beautiful, handmade projects that look like you spent hours and hours making them. Your friends and family will be so impressed! Wow, we had so many amazing comments over past few days. This preview got the most comments we have ever had with over 2140 of you telling us your favorite item from Tuesday’s preview! Oh my goodness, your enthusiasm has been contagious! Today is your lucky day Roxanne Henderson, Happy Friday! You will be receiving all of these new items soon and you have been entered to win a trip to the third annual Anna Griffin | Create! Let’s take a look at a few more pretty projects from Tuesday’s preview, shall we? 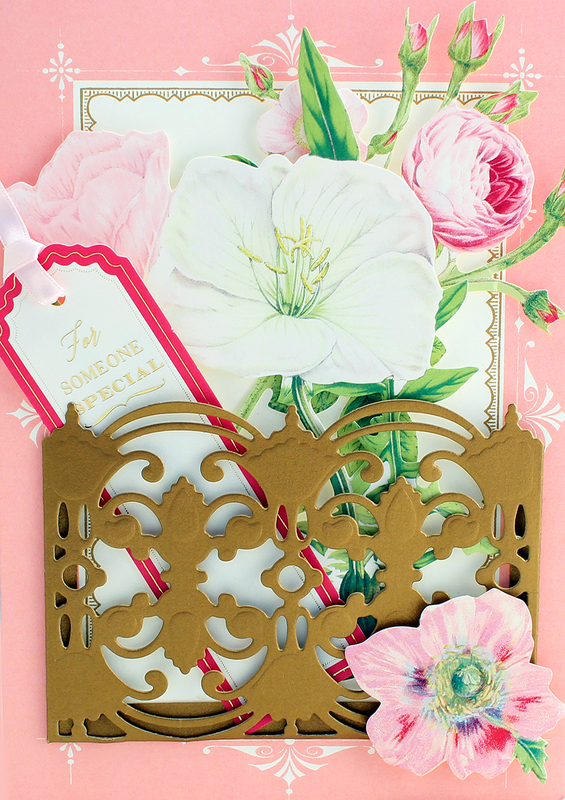 Our Window Box Card Making Kit with Cutting Dies makes creating beautiful, dimensional cards a breeze with card supports, stunning embellishments, sentiments and more! This is an autoship item with the next in the series being the Window Frame Card Kit with Dies, and lastly the Window Ledge Card Kit with Dies. You’re going to love this entire program! Sign up on March 8th to get these between now and August! The project below was made with the dies and a bunch of die cuts from our craft stash. See how this kit keeps on giving? Our new Pocket Dies are available in 4 different patterns: lace, rose, balustrade and butterfly designs. They create elegant pockets on your cards and scrapbook pages; you can even put a gift card inside! 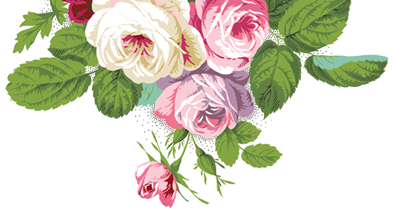 Our Pocket Embellishments are truly beautiful and include 288 antique ephemera diecuts, gorgeous flowers, vintage postcards and so much more. You can use the sentiments as bookmarks, and write a note on them for those who receive it. We hope these projects leave you inspired and ready for Tuesday with Sneak Peek 3! Have a beautiful weekend, everyone. Wow, love the bow maker ribbon box. I stink at making bows. Directions on top of the box is excelkent idea. Love the decorative border dies. Will use on cards & scrap pages. WooHoo! I can’t wait to get the decorative border edge dies. Such lovely items! So excited! I think the Ribbon storage/bow maker is my favorite though!! Oh boy such exciting new items! I may never leave my craft room again! This is absolutely adorable, i would love it in my scrapbook studio!!! Love everything, especially the new embossing folders. Oh my! These are FaBuLoUs!! Everything looks wonderful and your creative mind is amazing! LOVE The new Card Kits…Can’t wait to have them all ! I absolutely love all Anna goodies!!!!! Keep the great ideas going! I love most of all your word dies!!!!! We can do so much with them!!!! I love love love the dies! Can’t wait til the 8th! Love the Anna Griffin Dies, received some as a gift, but I don’t own a Cuttlebug, I have a Big Shot, does anyone know how to make the AG dies work in the Sizzix. Her items are wonderful and I’d love to get more of them, but hesitate because I can’t seem to figure out a sandwich for them. Thanks. Love all your products! Can’t wait for the shows! I’m am new to the Cuttlebug world and I have to say, all of the previewed items look fantastic. Choosing one is hard. The decorative edge die will take my crafting and card making to a new level! Another tantalizing sneak peek to March 8th! Really like the edge dies, they are pretty and I also like that they can be used so many ways, more bang for our buck! Good luck everyone!!!! Love the all! Everything! But the decorative edge dies are my fave! OMG! I love everything so far but those decorative edge dies are the BOMB! I can’t wait to get them! When I think I had all what allow me to create every beautiful card, a new and more exciting technic shown by Anna! Anne your Magic works on my heart! One more year and I retire, this excites me, all my collections you have dreamed for me will be adding many pleasure to my life and whom I’m making cards for! What a beauty the border and embossing folders! Can’t wait to have front of me! This is Magical endless way to please heart and mind! Anna, thanks once again for not letting us down with your fascinating contributions to our world of card making. It’s always difficult to pick one of your new releases over any other but today I’m going, hesitantly, with the Decorative Edge Cutting Dies (which are to die for, by the way.) Gorgeous and versatile. Love all that you do and always look forward to whatever comes next. Love the basics. Folders and die cuts make my crafting world go’round. And just because I have to keep asking….please don’t make us go through a Christmas without angels. Begging for Angel toppers. I know things have to be planned way in advance. Looking forward to the March show. They are on our list of product suggestions! Can not wait for the window frame card making kit. It looks absolutely breath taking. This past week I used my die cuts for the first time on the cuttlebug machine. I placed them upright and it went into my plates. Would like to purchase another A plate, as it seriously made cuts into it, I do not see them on file? Also love the ivory damask folder storage box. Will you make amy more? Thank you, Anna! I was contacted by Cricut this evening. Working on problem. Will let you know the outcome when problem is solved. I appreciate your assistance. This upcoming show on March 8 is going to be really great. I’m excited to be able to own some more of Anna Griffin’s beautiful card kits and can’t wait for the date to roll around! I just love all her crafting items for my card making and scrapbooking. I love the pop up cards. They are so unique! Everyone will love them. Take care. Congratulations Roxanne! I’m a little envious right now Anna is so talented that I start drooling in anticipation on what’s coming next. Hey Anna, don’t know if you are aware of the current problem with the Explore Air, but a lot of us have lost our “Print & Cut” feature when Cricut updated their software. We can no longer print from our cartridges! Tried several remedies Cricut recommended, but nothing works! We can no longer print from your Vintage cartridges, Holiday Luster Printables, even the Fantastic Flipcards Bonus Content! Not to mention others. Since you have a Golden Cricut, tell us, do you have this problem too? What can we do??? I did contact Cricut. Their suggestions didn’t correct the problem. Also checked YouTube. That’s where I learned a lot of Cricut owners were having the same problem. I think it’s really a shame that we are losing our Print & Cut feature after paying up to $300.00 for this machine, not to mention the $$ paid out for cartridges and monthly access to Design Space. Since you are one of their spokespersons for their product, I guess I was hoping you might be willing to look into it because your products will be effected too. Looking forward to seeing you on March 8th on HSN. We’re going to get you in contact with someone who can help! You should receive an email shortly! Beautiful. Can’t wait for the show. These Window Box Cards are super! I love them! I have made them before but would love to have dies that would make them! these are so, so pretty and I can’t wait to get them! Just when I think there is nothing else to buy, Anna comes out with another creative approach to card making with the gorgeous Anna spin to them. Thanks for making us look good! I can’t wait to purchase everything. Just so beautiful! Love, love the new products for March. Can’t wait for them to be shown on HSN. I love all your products, everything is beautiful. Congratulations Roxanne! I love my prize package from Sneak Peak #1. You will not be disappointed. I don’t like to wish my life away, but I can’t wait for March 8th!! I love the box cards and pocket dies! I’m so excited that Roxanne is able to be the winner for Create!!! Wow !! Your products are always amazing and easy to use I love them all!!! Congratulations Roxanne! And always thanking you Anna for more creative fun on this blog! Congrats! Have a wonderful time with all of your new treasures. Everything absolutely beautiful as usual!!!!!! Can’t wait until March 8th!! I got all excited thinking it was Feb 8th and looked and looked on HSN for your show. Silly me!!! Congrats to the new winner! Looks like lots of fun to me…and so beautiful! Just when I think you created the most beautiful cards you out do yourself again. You and your team are the best. Everything is just beautiful per usual. You never disappoint us Anna. To have such a talented mind is truly a gift that I wish I had, but I create because of you. Thank you so much!!!! Congrats Roxanne!! I can’t wait to see these beautiful things on HSN on March 8th! Thank you Queen Anna for all the ways you make the world so much more beautiful! Love the box cards. Haven’t attempted any yet but hopefully soon! These are all beautiful. Thank you for creating. Also thank you for putting the “save” Pinterest icon on the pictures. It’s great. Thank you. BEST FIRST GIFT TO EVER WIN IN A LIFE TIME. love ALL OF YOUR ITEMS. I love the boxes and can’t wait to get my hands on those. I have created cards for my mom and she won’t send them out . . . she is trying to shadow box them. Wonder what she will do with the box cards – those could sit on her dresser. Thank you Anna!! You’re killing me! I’m so glad I work from home! So, far I will be needing one of everything, and I’m soooo glad I have a new rack in my craft room! Such versatile dies. Love them all! Congratulations, Roxanne! You may also win a ticket to Create! Anna, I love the 4 Pocket Dies and and the Pocket Embellishments. I think you once said the postcards are based on your mother’s collection; if so, I love that! Wow, what a wonderful blessing to win something from our Ms. Anna. Congratulations Roxanne. My best wishes for lots of fun . Roxanne, I’m sure u know how lucky u are to win today:-) We are very lucky to have Anna not only be our mentor but a great friend as well. Happy Valentines to all Griffinites and HSN Staff as well. Your creativity sparks mine. You never cease to amaze me. Congrats Roxanne. Enjoy your goodies! You are too cool Anna! Congrats to Rozanne enjoy your new products. Looking forward to March. Anna, I just got an order for 27 box cards. Hurry up and get on HSN so they get to me soon!!! Hopefully, it will be easier and quicker to make them with the die and kit. Thanks again for presenting us all with so many nice things. Love the dimentional dies and pocket dies to. D’awwwwwwwww Congrats Roxanne, you’ll be receiving a wonderful gift… actually twice with the entry for Create!! Hope you have a blast with the new products, Roxanne! Hope to win one day too. Congratulations Roxanne! I know you will enjoy crafting with these new items. I can’t wait to order them for myself on March 8th. Have fun creating some beautiful projects! Congratulations to the lucky winner!! Congratulations to the winner!!! I hope one day to win!!! Excited to see Anna on HSN again! How awesome for you Roxanne! Looking forward to the show in March! Still hoping one of these days I’love win!! Congrats! Everything is beautiful. I have a large family (on both sides), so I can really spread the joy. So happy for, and jealous of Roxanne. Can’t wait till I can get these on March 8. Love the card kit and the pocket embellishments. I absolutely love these box cards! I can’t wait to get them. I love all the new dyes. You have the best products. Can’t wait for March 8th. So happy for you Roxanne. Enjoy your goodies. I can’t wait for March 8th. Blessings and have a great weekend. Congratulations Roxanne! Have fun with your new toys! March 8 can’t come soon enough. Congratulations to Roxanne. I am really looking forward to getting these two wonderful products. I can not wait until Maarch 8. Lot of fun things to do. Congrats Roxanne! You lucky girl! Have fun with the Create Three entry! Woo-hoo! GO, Roxanne Henderson! I’m so happy for you! (wish we had a video of your happy dance! hahah) Congratulations on your big win! I can imagine time will drag for you until you get your winnings at the door. Then, watch out! Roxanne will be on the move, crafting box cards and pockets! Fun! Tell us; did you squeal with delight when you saw you won? (I suspect you did.) 😀 Happy Day, Roxanne! Enjoy all your wonderful products and have lots of fun and creativity using them. Have a great weekend!! Thank you so much for bringing all these new products. Love the above. Hope the winner enjoys her new toys. Take care and see you in March. Congratulations Roxanne!! Have Fun Crafting w/ everything. It All looks like FUN!! Congrats Roxanne those kits are beautiful!! Oh, my goodness! You have surpassed yourselves! These cards will stand out from among others just like pop up and flip cards! This is exactly what is meant by 3D! I love them all, but the box is my favorite, and as usual you made it so easy. So beautiful.. Love the box cards! Amazing….love the window box cards! I love these cards! My wallet is crying “uncle “!!!! Oh happy day for Roxann. You hit the lottery today. Enjoy. You are making all of us so antsy! Can’t wait to get my hands on these new dies. Everything I look at is so beautiful. Love it all. My group made box cards on two occasions. We learned a different size each time….same game, different size. It is good to know how to make your own buttermilk pancakes, and then, isnt it nice when you discover a brand that is as good as yours, but easier and more available and more likely you will make. I think the fancy folds will be awesome additions to my growing Anna die collection, and I will reach for them often. Will be so glad when the die storage binders are back. Mine had damage in the mail and had to be returned. Wishing all a Happy Valentine’s Day. Congratulations Roxanne! What a blast you will have with all of these items! I’m so happy for you! I love the idea that someone mentioned of using the pockets on the inside of the cards as a money or gift card holder!! Anna, I have to say your fans are the MOST creative people on the planet! Looking forward to next year’s Create already. It’s my birthday so everyone has to come! These cards are stunning. It looks as if we have to start saving up for some of the new products on March 8th! Congratulations Roxanne! What a wonderful assortment of gifts! We are all happy for you! Congratulations Roxanne! I can’t wait for this to be available, I LOVE these box cards! Congratulations to Roxanne! What an awesome prize as I think Tuesday was my favorite preview ever!! I had a idea on the pocket dies that I can’t wait to try. If you use a sentiment sticker (as opposed to a paper sentiment insert) for the card interior, you could use the pocket die cut on the inside of the card to create a fabulous money/check holder card. I can’t wait for the March 8th. – think I may have to take the day off from work so I can enjoy crafting all day while shopping! Box Cards are the best, and Anna, yours are so beautiful! 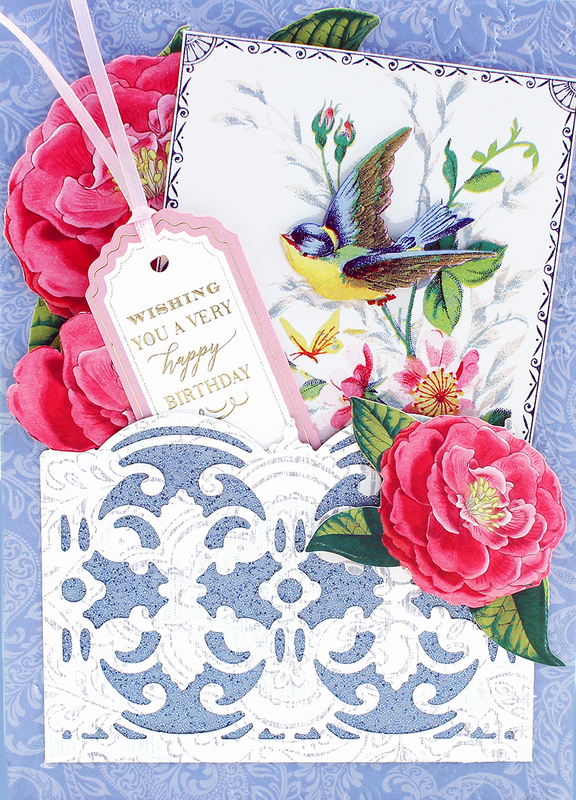 Thank you, Anna, for your inspiring new card crafts, embellishments and sample cards. You and your team provide such joy to me. Looking forward to more blogs and March 8. I love these box cards. I cannot wait to see what you have in store for us, Anna. Congrats to Roxanne ~ enjoy your goodies!! And good luck in the November drawing!! Everything is gorgeous as always…the little pockets are brilliant for both cards and scrapbooking, which I still love. 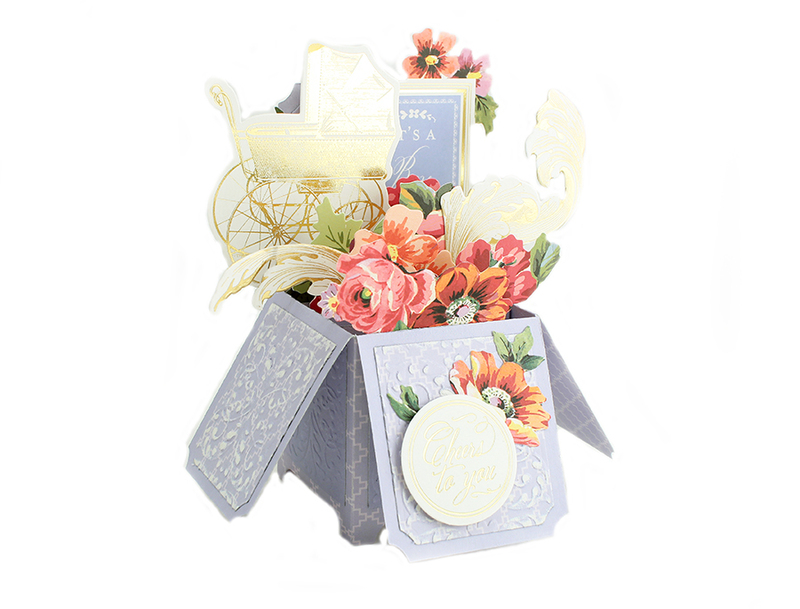 Love these boxes and dies, beautiful! I have been crafting for most of my life. Grant you that for many years it was school related. There were even two years that I made one or two scrapbook pages for my first graders for X-mas gifts. Imagine my surprise when I January when the kids came back to school, I learned that no one have a scrapbook, and that my gift was taken away from my students and nailed into the family room or parent’s bedroom wall. My friends and family want to know how my cards keep on getting better and different every year. They are always asking if I made them myself. I never give away my secrete unless they craft…my secrete is Anna Griffin. Thank you Anna for all the new surprises!!!! Love these 3D cards! I make them all the time but if these dies decrease the amount of time I use measuring. Cutting and scoring, I’m all in. Awesome new products! Can’t wait for March 8! Congrats, Roxanne. Many happy moments making these clever cards are coming your way. Love these examples of cards with the new dies. So pretty. A nice new way to send a really unique card for any reason. Cannot wait to get my hands on these goodies. Goodness, the previews are exciting. Congratulations Roxanne !! Enjoy your winnings !! How much is that doggie in the window? Can’t wait to see the little doggie die-cut that comes with the palladium window set !! So very jealous of Roxanne! Enjoy these amazing goodies Roxanne! So lucky! Hi Miss Anna and Crew! Wonderful second look at these beautiful, fun designs! So different and new….and…because it’s going to be designed by Anna I know I will be able to accomplish these gorgeous creations! Congrats to Roxanne…you are one lucky girl! Congratulations to Roxanne! SOOO lucky! reading were shown in the order they were left so you have to go all the way to the bottom to find the space where you can type yours. Hope this helps. I know the odds of winning are pretty high but it’s so much better knowing that now I at least have a chance. And congrats to the winner this week. Way to go, girl!! Anna, these are gorgeous with your style papers and colors. I definitely need more practice using these box cards. They are so beautiful! The boxes are gorgeous! Have marked March 8th on my calendar. So beautiful! I definitely need more practice making these box cards. Congratulations Roxanne! You must feel pretty lucky considering how many posts Anna gets each week. Anna, your products are amazingly beautiful! I already know that I will be working on March 8th,so hopefully I can tune in to your later appearance. Wish I could be off Anna! Thanks for all the creativity you share with us! Thanks so much for adding even more creativity with your card kits. I love getting another look at the new box cards. I just sent off a flip card to my daughter-in-law. Everyone in my family waits to see what kind of birthday card I’ll come up with next – they’ve seen a lot of Anna Griffin that’s for sure. Would love to have box cards be the next of my birthday cards. My credit card is out, waiting for March 8, so I can purchase these wonderful kits. They bring such variety to card making and inspire me to make more beautiful cards with ease. Thanks, Anna. Y will be picked….hint, hint.. In the meantime can’t wait till March 8th. Cannot wait to see what you bring on Tuesday! simply beautiful! Congratulations to Roxanne. When I first saw the new window cards my mouth was hanging open like a dog salivating over a treat! They are gorgeous !!!!!!!!!!!!! There are no words to describe them. Thank you Anna and the Team for all of these outrageous pieces of art! I love…love…love those cards! They are gorgeous! Cant wait to see evetything! Congratulations Karen, and thank you Anna! Irene, Most of the time you just have to comment to Tuesday sneak peek blog just like you commented to this blog. In Tuesday’s blog, after the preview, Anna always tells you what to do to win the items shown in the preview blog. We are looking forward to all the new products and fun Anna will bring to us this year! Can’t wait for March 8! the boxes are really cute. Can’t wait for the Create III announcement. Already got the green light to attend and my schedule is cleared for all of November … LOL!!! Congrats to the winner today. Congrats to Roxanne! Have fun with your new goodies! Again we see something that we didn’t know we wanted until Anna and her team show us what we’re missing! Congratulations Roxanne! You’re going to make so many lovely things with your new collection of goodies! Roxanne ROCKS the Anna Griffin Winner’s Circle! Congratulations! Love it!! Can’t wait for them to be available on March 8th. Lucky you Roxanne! Guess I will have to order mine! Congrats to Roxanne you have one the best yet, with the exception of the cricut winner, I can’t wait to purchase it. I have so much stuff that has come since xmas I just LOOK at it and don’t know where to begin, That’s half the fun looking at all of Anna’s new items as they arrive. The window box creations in my opinion are tops of all card making kits ( I have them all) as many of you out there have too. Thank you Anna for your continuous love of constantly creating beautiful items. Everything is just beautiful! Anxiously waiting for information on Anna Griffin Create 2017! Thank you Anna and your team for all you do! Congrats to Roxanne… Lucky lady! WOW, these are gorgeous! Looking forward to March 8th. Congrats Roxanne! I look forward to ordering these new card making kits. Congratulations Roxanne! I can hardly wait for March 8th!!! These are outstanding! Can’t wait until March 8th! Excited to see all the new products! Can’t wait till the 8th! I really am glad to hear these great kits are on Autoship. The box card kit is something I’ve been hoping for for a while now. Thanks Anna! 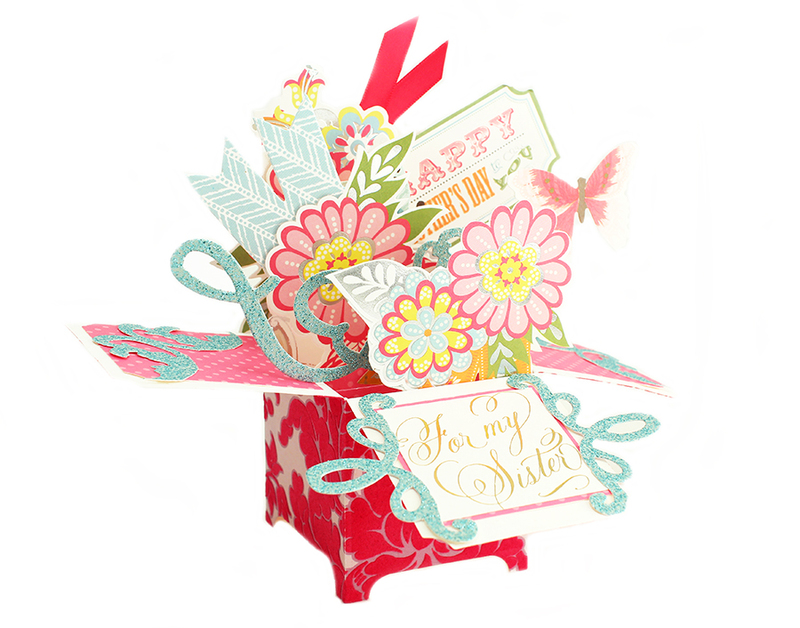 The window box card kit with dies and the pocket dies are going to make exceptionally beautiful cards that are unusual! I am excited to be able to purchase these as soon as they are available. This takes the creativeness to a new level. Congrats to Roxanne! March 8 cannot come quickly enough. I really look forward to Tuesdays and Fridays! Thank you, Anna! These pocket dies are AWESOME! 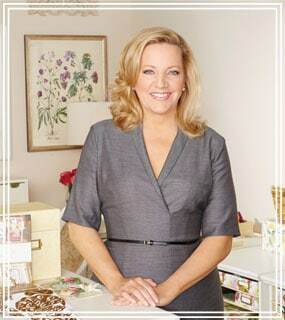 Can hardly wait until you are back on HSN! Have SO been looking forward to this release, ever since you talked about it at Create 2 and especially after seeing the prototype on the display table as we entered your warehouse. Can’t wait!! Thank you for reaching out to us about where to buy our products in the UK. We are no longer available on The Craft Channel as they have ceased doing business. Please know that we are working diligently on a new plan for the UK market! In the meantime, please sign up for our newsletter at rsvp@annagriffin.com so we may contact you once we have a new partner. I really, really need more envelope liners! Will they come back in stock? I’m looking forward to making pop-up boxes! How exciting for Roxanne! Congrats! I love love love all the new items so far. Anna, if you are saving the “best for last”; I can not even imagine what is next. So full of anticipation. Congratulations Roxanne! Looking forward to the next sneak peek!! Love Tuesdays and Fridays! Anna when will the masking embossing folders be back? They sold out last time before I could even look at them! Congratulations Roxanne! Can’t wait till March 8!! Thanks for such beautiful, quality products Anna!! Congratulations to Roxanne. I am making my list for the 8th! Can’t wait for the event on HSN. Each presentation is better than the last! Spend several hours each day making cards, with all but the greetings, so when the need arises I have the perfect one and only have to add the sentiment. Love box cards, getting list ready! My family thinks im so talented, i realy just follow Anna, lol. congratulations Roxanne! Im sure you are going to LOVE all the great stuff coming your way! I love these new pocket dies. I can picture these dies being used for a variety of scrapbook projects for me. Love Love Love at first sight. Can’t wait until I can purchase them. Would you be kind and share with me how I can be part of the next participant? I could not figure out yet! All you have to do is comment on the post to enter to win. We draw a winner at random on Fridays! Congratulations Roxanne! Good luck in the Create 3 entry!